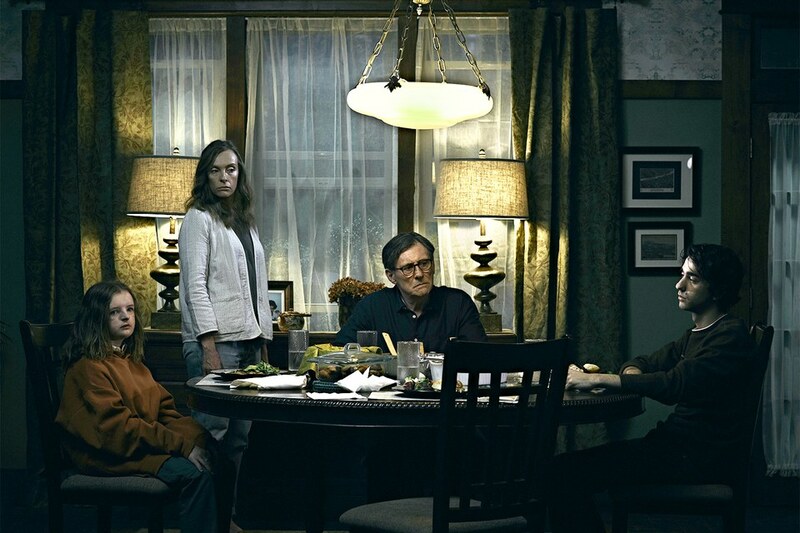 Hereditary is so scary relatives five generations back will be able to sense your fear. How in Satan’s pitchfork-lined hellscape is Hereditary a debut feature? Ari Aster’s inheritance nightmare is abusively tense and traumatic even before an end-all third act crashes down with thunderous implications. Through my screening’s *entire* running length, two fellow critics flanking both my sides audibly gasped and ducked to ward off anxiety attacks – one dry-heaving at points when suspense become unmanageable. That’s what you’re in for. A seductively paced ancestral bone-quaker that’ll bind you, gut you, and laugh as you writhe in discomfort. In other words, PRAISE BE THE GENRE OVERLORDS FOR I DO NOT NEED SLEEP NOR SANITY TO BE HAPPY. Hereditary tells of the heartbreak and misfortune that haunts Annie Graham’s (Toni Collette) family. Husband Steve (Gabriel Byrne), son Peter (Alex Wolff) and daughter Charlie (Milly Shapiro) mourn their grandmother’s death with normality, and at first, Annie follows suit. She spends her days designing miniature home replicas – inside and out – for her latest gallery opening, until a fateful night that alters their collective lives forever. Cue another funeral, except this time the Grahams don’t rebuild themselves – they fall apart as Grandma might have intended. Make no mistake, Toni Collette deserves an Oscar for what Aster turns her into. As a woman whose relatives share histories of mental illness – atop her own “sleepwalking” problems (that strain her relationship with Wolff’s Peter) – Collette commits to Hereditary’s ambiguity with sinful disorientation. Dementia demons could have forcefully taken control by this point, or it’s equally plausible she’s being tailed by demonic entities after a seance awakening – but either way, the game is constantly afoot. Her dioramas begin mirroring the family’s earned tragedies, she begins waking up standing over Peter’s bed (again), and her erratic outbursts range from chattering hysterics to legitimately dangerous flexes of autopilot confusion. Collette reaches genre superstardom alongside Rosemary’s Baby, The Babadook and other top-tier horror mothers. She’s this year’s current actress to beat. Aster himself is a master of tone, in that Hereditary relentlessly disallows us to draw even a single breath. Once Peter’s car veers jerkily to avoid highway roadkill, the film *never* releases audiences from its frozen constriction. First with a long-hold on crime scene gore that we beg to be removed, then as a shattered family attempts to grieve, and finally with cultist overtones that submerge an antique woodland home in piss-your-pants realities. Aster doesn’t just terrify his audience, he flirts with the devil to achieve transcendent levels of torment. Sequences play an excruciatingly long game, always ending with a yell, or flail or jump behind some kind of optical barrier. There is a shot – that I will call *the* shot – worthy of top terror honors come any cinematic year (tied with 2018’s Pyewacket, based on similarity). A pitch black cold open, a hidden surprise for eyes once they fully adjust (bonus enjoyment if you catch said “treat” before other audience members like I did). And the last ten-or-so minutes? Start prepping now (wire usage, corpses, dangling accents, levitation, etc). As odd as this is to say, Hereditary captures scenery with very Game Night similarities (dope cinematography, yo). As Game Night mimicks board game views from above (blurred surroundings, hard focus on center), Aster uses this same style to make buildings appear as Annie’s model replicas in addition to very boxy and room-full landscapes. Rarely does the camera cut empty space for character focus, choosing to hold wall-to-wall length views. Think blueprinted schematics, as the characters themselves are being observed by a larger force. Something that enjoys destruction on high-grade levels of namesake dissonance. A family unable to run or believe, generational plans set in motion like thorns on a family tree. Artistic, angst-kissed and stupidly malevolent. The psychologically/supernaturally embattled Collette does not carry Hereditary alone. Without Gabriel Byrne’s quiet assistance (simmering concern) and Alex Wolff’s remorseful paranoia (fear at its purest), there wouldn’t be hints of the ordinary to compare against Collette’s frenzied breakdown. Without Milly Shapiro’s owned existence as a “curious” 13-year-old who scissors the heads off birds and builds junkyard toys, that pain of loss wouldn’t be so catastrophically stinging. As genealogy walls are broken down and clues uncovered, Wolff’s performance becomes a reflection of our own reactions – his scared, unsettled gaze so frightened by what could happen next (with earned reason). Such strength in acting, so much hurt thickened by a genre filter. Remember when The Witch coasted on “scariest movie of your puny existence” hype? Unfortunately – at no fault to Robert Eggers and his team – “deceptive” marketing ran with a few choice quotes that warped expectations. Hereditary – on the other hand – is a rare case where hyperbole is required. It’s a tonal masterclass that delves into ubiquitous genre-bending devastation with no allowable escape, plotted admirably and wound tightly with poison-laced barbed wire that taunts as it twists inward. Prepare to be turned-ghost pale by horrors of the mind, body and soul, unlike you’ve experienced in quite some time. This isn’t The Witch (exquisite period dread, little mainstream scares) or It Comes At Night (strong survivalist thrills scant on jumps). Ari Aster, look at what you’ve done (and burst with pride, ya mad genius).